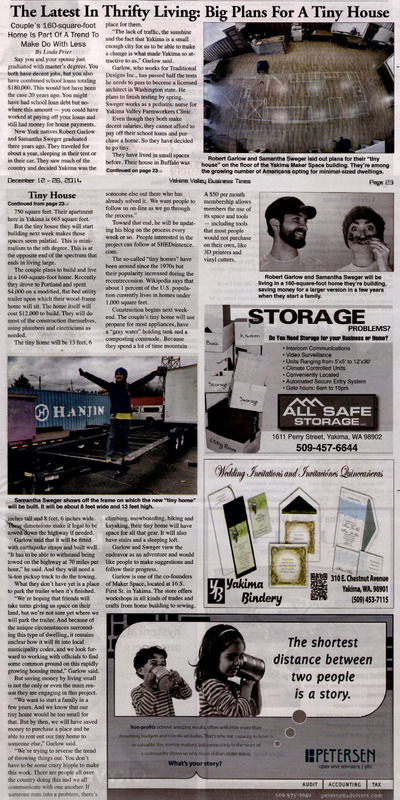 We were interviewed a few weeks back before we ever started building and here is the pieced together article that was featured on the front page of the Yakima Valley Business Times. It is always interesting to hear your ideas interpreted and articulated by others. Lessons Inspired by Unfortunate Circumstances. I heard about what you guys are doing from that article and I was really intrigued. I think it’s really cool! I work over at Tacoma Scew so if you guys need any help finding the correct fastener or anything just let me know. As odds would have it, I (Robert) am heading over to Tacoma screw today look for (20) 5/8″ x 5″ bolts to anchor the floor system to the trailer. I will try to get in contact with you.